The train during the attack. 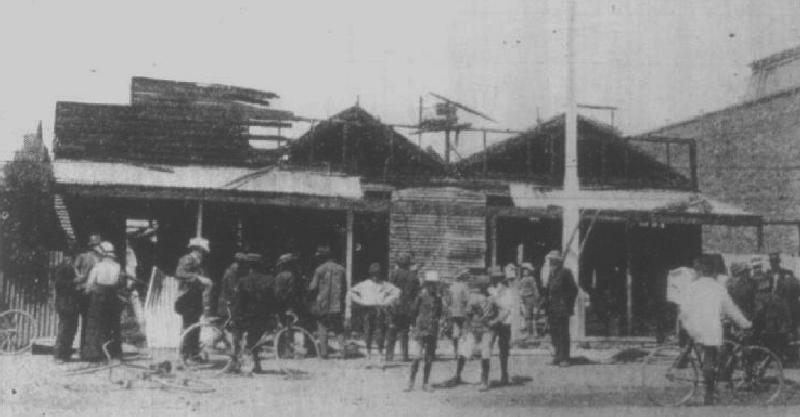 Broken Hill, an affray on 1 January 1915 caused by two Moslem men who raised the Turkish flag and began shooting at residents of this mining centre in western New South Wales. The men - both long-time residents of the district - were actually Afghans not Turks, though one (an ice-cream vendor) had at one time served in the Sultan's army and reportedly remained fanatically devoted to Turkey's cause in the First World War. The other was a former camel-driver who acted as the mullah (religious leader) of the local Moslem community. The first target attacked was a train of 40 open ore-trucks crowded with 1,000 people on a holiday picnic to Silverton. Shortly after 10 a.m., as the train was heading west about three kilometres from the town, the two Afghans opened a heavy fire into the exposed passengers from a bank close beside the tramway The three people killed and six wounded were of all ages, and both sexes. The train was not stopped until out of range, then the alarm was raised by telephone. Police and available troops, as well as some members of the local rifle club, were hurriedly assembled to begin a pursuit. In the meantime the two riflemen had gone to a cottage on the town's outskirts and shot its elderly male resident, before retreating to a low rocky hill north of the town. A policeman who stumbled upon them here was wounded, but the two fugitives were now promptly surrounded. In the fire fight which followed, lasting until after midday, one of the Afghans was killed and the other seriously wounded before capture. That night, a large group of outraged citizens gathered in the town centre. 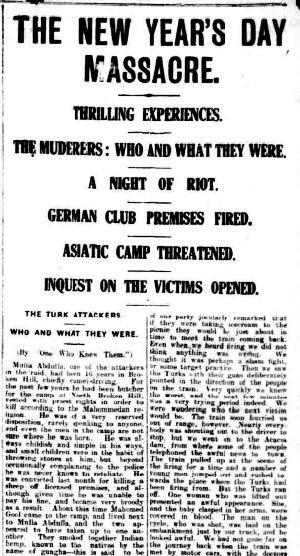 In the belief that local residents of German origin had instigated the attack and supplied the weapons used, this mob marched on the nearby German Club and burned the building down. Members of the crowd also decided on a similar demonstration against the Afghan camel camp situated beyond the town limits, but police prohibited a march en masse. When smaller parties eventually reached the camp they found it guarded by ten police and 50 armed soldiers. Rather than take on the inhabitants' protectors (who were, in any event, the same men who had earlier subdued the two murderers), the crowd of intending avengers dispersed without any further disturbance. E. Scott (1938), Australia during the War, Sydney: Angus & Robertson. Brian Kennedy (1978), Silver, Sin, and Sixpenny ale, Carlton, Vic. : Melbourne University Press. The Roll of Honour contains the names of all the Australians who lost their lives during the Battle of Broken Hill, New South Wales, 1 January 1915. Lieutenant Resch is none other than Richard Nicholaus John Resch [aka Fletcher] (b. 1881 Wilcannia - d. 1960 Chatswood), the nephew of Emile Resch, the founder of Resch's Brewery interests, well known to New South Welshmen of an earlier era. Resch served in South Africa with the 1st Australian Horse. He took part in the Relief of Kimberly and the various campaigns in the Orange Free State from February to May 1900, including operations at Paardeberg, Dreifontein, Poplar Grove, and Zand River. Subsequent to that the unit moved into the Transvaal and to the west of Pretoria including actions at Zilikats Nek, 2 August 1900, then east of Pretoria with actions at Belfast and Middleburg. Resch was awarded the Queen's South African Medal with five clasps - Cape Colony, Orange Free State, Transvaal, Driefontein and Belfast. Resch was a genuine Boer War Veteran and no slouch as a soldier. It turns out that Resch came to Broken Hill in 1908 to manage the Brewery for his uncle until 1914 when he took over the whole business. In 1912 he married Emma Ann I Fletcher (b. 1879 Cowra - d. 1962 Chatswood) at Broken Hill. 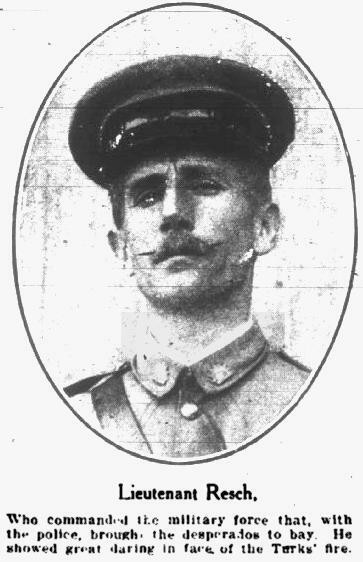 Resch was commissioned a Lieutenant with the Senior Cadets in 1911, a position he retained for over a decade. He also was appointed as an Area Officer for Broken Hill. At the same time he was Adjutant for the 82nd Infantry Battalion. In March 1915 he was given full command of the Battalion while the Commanding Officer was absent on AIF duties. So taking command of the situation was something Resch was familiar with, so too was fighting a battle. Emile Resch, Richard Resch's uncle, was a very popular man around town. He was one of the key committee men and founders of the German Club which was burnt down after the battle on 1 January 1915. When Emile Resch died in 1930, there was a huge funeral for him with tributes coming from all quarters. So why did the rioting mob in Broken Hill burn down his club? One upshot of this episode was to prompt Resch to change his German sounding name to something more Anglo-Saxon so he adopted his wife's maiden name Fletcher in June 1916 and remained so for the rest of his life. Ironically Edmund Resch had been the Honorary Consul for the Netherlands in New South Wales for many years. The final link between the Resch family and the brewery along with hotel chain was severed in 1924 when Tooth and Co. Ltd. of Sydney made an offer too good to refuse for the business. The family retired to the pursuits of the wealthy, a role which involved a social scene, charity works and internecine squabbles in the courts. THE NEW YEAR'S DAY MASSACRE. INQUEST ON THE VICTIMS OPENED. WHO AND WHAT THEY WERE. Mulla Abdulla, one of the attackers in the raid, had been 16 years in Broken Hill, chiefly camel-driving. For the past few years he had been butcher for the camp at North Broken Hill, vested with priest-rights in order to kill according to the Mahommedan religion. He was of a very reserved disposition, rarely speaking to anyone, and even the men in the camp are not sure where he was born. He was always childish and simple in his ways, and small, children were in the habit of throwing' stones at him, but beyond occasionally complaining to the police he was never known to retaliate. He was convicted last month for killing a sheep off licensed premises, and although given time he was unable to pay his fine, and became very broody as a result. About, this time Mahomed Gool came to the camp, and lived next to Mulla Abdullah and the two appeared to have taken up to one another. They smoked together Indian hemp, known to the natives by the name of gungha - this is said to be even more potent than opium. Mahomed Gool is said to have been a Turk; born near the Persian border. He was in Broken Hill previously many years ago, then left Australia and travelled the world. He returned here about two years ago, and lived in central Broken Hill, working on the mines. He was a Mahommedan, and on that account and having no work he shifted to the camel camp a few weeks ago. Mulla Abdulla was never known to possess firearms, and it is believed, says the man giving this information, that Mahomed Gool found them, and the ammunition, and with the help of "Gungha" had Mulla Abdulla under his sway. The men at the camp; although called Afghans, are not. They come from various parts of India, and are all British subjects. Many of the men have served in the British army and at the commencement of the war, thinking, that fighting would take place in Adelaide, went to the police station and offered their services, saying they would fight for Australia to a man. They are said to take great interest in the fighting, and are intensely loyal. There has been quite an exodus lately of these men returning to India (paying their own expenses) to take the place at home of younger relations who have gone to the front with the Indian army. Five men left together for this purpose only three weeks ago. The men at the camel camp are very bitter against the perpetrators of yesterday's raid, and say they will have nothing to do with the bodies. They say also that, there is but one Afghan in the camp. He is married to white woman and has five children. The question has been asked over and over, again, and by many people since yesterday morning's tragic occurrence, as to the motive of the men in attacking the picnic train with its load of women and children, and how they came to do such an act when they must have known that for them there could be no escape. Inspector Miller, last night, when the question was put to him, expressed the view that Gool Mahomed was the instigator of the affair. "Gool Mahomed is a Turk," he said, "with a Turk's lust for blood, and he was out for revenge as an enemy of the British. I believe that he talked Abdulla, who is a Hindu, in into it. Abdullah was fined in the court recently, and was unable to raise the money to pay the fine. Mahomed probably used this as a lever and suggested to Abdullah that there was very little to live for, and that he was certain to be arrested to undergo imprisonment. He no doubt preyed upon Abdullah's mind until he was persuaded that it was better to die and that it would be dying gloriously and with the certainty of great happiness in the hereafter if he killed as many of the British as he could before he was himself slain. Mahomed then made his plans and Abdullah, falling in with them, the pair carried them through with all the tragic awfulness of the result." In his efforts to persuade the crowd to forego their intended attack on the Afghan camp last night, the inspector used the argument that the Turk was the responsible party, and that it was unjust to accuse the Afghans, many of whom had volunteered for service with the British forces, of any actual or even intended participation in yesterday's tragedy. A lady who was one of a party of friends on the M.U. picnic train yesterday, recounted her experiences to a "Miner" reporter last night. The lady had not long been out from England, and the ride in the open trucks - a kind of passenger accommodation unheard of at home for generations - had been looked forward to by her as a new experience. "It was certainly a novel experience," she stated, "and it was also a terrible one. It was an experience I shall never forget as long as I live. There was only one truck between the one I was in and the one that suffered most from the firing. "It was all so sudden, so unexpected, so astounding, that one almost forgot to feel afraid, but gazed instead in open mouthed wonder," she continued. "We saw the ice-cream cart drawn up near the pipe track as we came along and we saw the flag on the cart. One of our party jocularly remarked that if they were taking ice-cream to the picnic they would be just about in time to meet the train coming back. Even when we heard firing we did not think anything was wrong. We thought it was perhaps a sham fight, or some target practice. Then we saw the Turks with their guns deliberately pointed in the direction of the people on the train. Very quickly we knew the worst, and the next few minutes was, a very trying period indeed: We were wondering who the next victim would be. The train soon hurried us out of range, however. Nearly everybody was shouting out to the driver to stop, but we went on to the Acacia dam, from where some of the people telephoned the awful news to town. The train pulled up at the scene of the firing for a time and a number of young men jumped out and rushed towards the place where the Turks had been firing from. But the Turks ran off. One woman who was lifted out presented an awful appearance. She, and the baby clasped in her, arms, were covered in blood. The man on the cycle, who was shot, was laid on the embankment just by our truck and he looked awful. We had not gone far on the journey back when the train was met by motor cars, with the doctors and police, and friends of some of the picnic party. 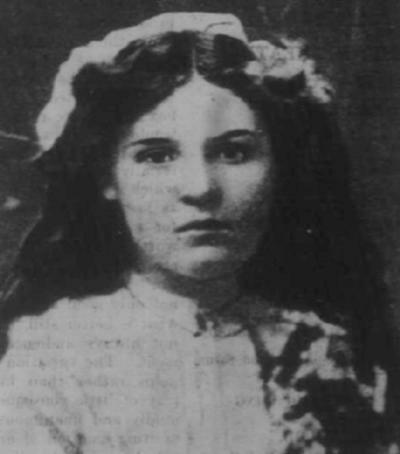 "I am sure," concluded the lady, "that the men intended to shoot the engine driver, but misjudged the distance and the pace of the train as the first shots entered a truck very near the front of the train." Another picnicker, a young man, stated that he was in one of the trucks with a number of other young fellows. They were having a jolly time amongst themselves. When they saw the ice-cream cart they shouted "Happy New Year," and "Good luck, old-fellow," in hearty style, just for the fun of the thing. Then the shooting started. "Me and some of the fellows jumped out of the trucks we were in and sought refuge behind the front carriage. Two or three stray shots however, came amongst us, and we ran to better shelter behind the railway embankment, and there stayed until the train was under weigh again. Some of the fellows, more plucky than we made a dash for the nearest telephone in order to ring up for assistance." The young man had one of the cartridges which had been picked up in his pocket, and he showed it to "The Miner" man. It was a large cartridge, much larger , than the ordinary cartridges now served out to the troops, and the bullet was very large indeed. Mr. P. Nelsen was one of those on board the train who had a narrow escape. A bullet, he says, whistled past his ear, after entering the brake in which he, Mr J Davis, and others were, and embedded itself in the other side of the carriage, entering woodwork and bulging the steel plates on the outside. He, this morning, went to the Silverton Tramway Company's offices and saw Messrs. Sheehan and Spence, asking for the bullet to keep as a memento. They promised to extract the bullet after the police had finished their inquiries into the whole tragedy. "I am lucky to be alive," said Mr. Nelsen this morning. "Another eighth of an inch and I would not be alive to-day. 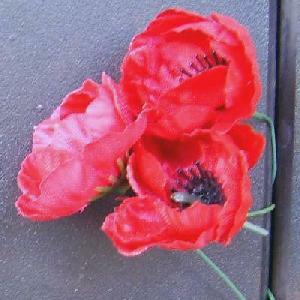 I shall never forget New Year's Day of 1915." QUESTIONED BY MURDERERS AT GOODS STATION. Two boys (Rex Thorn and Reg Bray), both of Newton- street, Railway Town, were returning from the coach station at about 9.30 a.m., after driving some lady passengers to join the picnic train, when they noticed an ice-cream cart near the Pell street railway crossing. As they came close to the cart the driver (Mullah Abdullah ) signalled by putting his hand up for the lads to stop. They did so, and Mullah Abdullah asked if the picnic train to Silverton had gone, and the lads replied "No." He then asked "What time does it start ?" and they told him. He next inquired "What is the time now?" and the boys replied. He finally asked which way the train went, and they having told him, said "Good day," and drove on. The boys state that both men were wearing turbans, but that there was nothing suspicious in their appearance, nor was the red flag at that time flying. Among the army of armed men who were fighting the murderous Turk and his companion yesterday was a boy with a pea rifle as his weapon. He took up a position well in the firing line, and appeared to be as keen as anyone for opportunities to take a shot at the enemy. Mr. A. E. Millard, one of the victims of the tragedy, was a resident of Rennie-street, Balmain, Sydney. He took Mr. J. Duncalfe's position in connection with the pipe- laying of the Umberumberka water service. Mr. Duncalfe's father was the inventor of the wooden water pipe in America, the pipe being used in connection with the Umberumberka scheme. It was stated over the telephone from the Hospital this morning that the wounded patients who were brought in, from the M.U. picnic train after the shooting affray yesterday were on the mend. In the morgue at one time yesterday were the bodies of the two murderers and their four victims from the M.U. picnic train. It is doubtful if the place has ever before held so many bodies of persons who had met with violent death. PRAISE FOR MILITARY, POLICE, AND CIVILIANS. It was warm work for the soldiers, police, and civilians who were out exchanging shots with the Turks who fired on the M.U. picnic train yesterday. "We must have been exchanging shots for nearly two hours," said Sergeant Dimond. 'To us every minute seemed an awfully long time. For a time the Turks kept bobbing their heads out and having a shot and then seeking cover again. I believe that one of them was settled early in the fight, however, as for a long time only one man was firing. He kept going pretty briskly for about an hour and then his shots became less frequent and less dangerous. He was evidently badly wounded, and could shoot only with difficulty. I was told that just before the end came the surviving Turk was seen to stagger to his feet and hold his arms out without any gun in them and that in one hand he clutched something. that looked like a white handkerchief. It was suggested that he was flying a flag of truce for surrender, but 1 did not see it myself. "I escaped the bullets," continued the sergeant, "but I was told afterwards that at one time the bullets were dropping all around me. The military behaved splendidly all day, and were of the very greatest assistance to us. So also were armed civilians." Inspector Miller joined with the sergeant in praising the military, and they were also one in opinion as regards Lieutenant R. N. J. Resch, who, they stated, acted splendidly and did all that it was possible, for him to do with willingness and promptitude that were very gratifying. The police also received their mede of praise. "Sergeant Dimond," said a man in the street last night while a reporter was standing by, "I'm very pleased to see that you are safe. I'd heard that you had been wounded; I'm really sincerely glad that you hare escaped and keenly sorry that some of your men were, injured. I've often said hard things about you in ordinary times when I have seen you doing your duty. But I see now that you are prepared to do your duty even under the risk of death. The police all did their work finely. I'm only a hard worker on the mines, but I'll remember this day's work and the bravery of the police." The speech was a long one and was several times interrupted by the sergeant with: "That's all right, old follow," "Oh, yes, it's all right," and other remarks, but the man was determined to express his appreciation, and be did so. The inquest on the bodies of the victims of yesterday's tragedy was formally opened this morning at the Courthouse by Mr. Butler, .S.M., coroner. Mr. Butler said that he had viewed the whole of the bodies, but understood that the police wished an adjournment. Inspector Miller: Yes, there is much evidence to collect. We would like an adjournment not earlier than the middle of next week. Mr. Butler: Very well, I adjourn the inquest until Thursday next, January 7, at 10.30 o'clock. Is there any application for a jury. Inspector Miller: No, but I believe one of the dead men was a member of the A.M.A. Mr W. D. Barnett at this stage engaged the court and conversed with Inspector Miller, after which Mr. Miller stated that the A.M.A. did not ask for a jury. Three of the dead, he added, were members of the A.M.A. MARCH TO THE CAMEL CAMP. Following upon the terrible tragedy of yesterday morning; a turbulent crowd assembled in Argent-street last night and started upon a career of destruction. At about 3 o'clock there was a big crowd, mostly of young men and youths in the vicinity of the Police Station. Exciting debates as to whether the perpetrators of yesterday's outrage were Turks, or Afghans, and whether or no they were set on to their awful work by Germans were taking place. Those who contended that the Germans were the authors of the outrage, were in the majority, and a few of the ringleaders raised the cry of "To the German Club, lads." The call needed no repetition. There was a ready response, and a mixed crowd of several hundreds made off towards Delamore- street where the headquarters of the German Club are situated. "The crowd took up a stand in front of the premises, which, .appeared to be empty. Quickly, the scene became riotous in the extreme, as stones were hurled against the walls and through the windows, while the crowd alternately cheered or sang snatches of patriotic songs or gave loud tongue to terrible execrations on the heads of all foreigners, Germans, Turks, and Afghans in particular. After a few minutes spent in this way, there was a dash towards the building, and some of the men forcing an entrance, caused considerable damage inside. These were, after a brief interval, called out, and others advanced, and apparently following a prearranged plan, scattered the contents said to be methylated spirits of two bottles in the front portion of the building. Lights were then applied. Flames at once shot upwards, and ignited the woodwork of the premises. In a few seconds, less time than it takes to write, the whole front of the building was one mass of fire, which was rapidly burning the contents and exterior woodwork, including the verandah. When the fire was at its fiercest, and the heat from it was almost unbearable eren on the other side of the road, the fire brigade steamer with its crew arrived on the scene. The gable end of the adjoining house, owned by Mr. A. Marks, and occupied by Mr. D. Desmond, was then blazing, while the building on the other side of the club premises, Messrs. G. and R. Wills' warehouse, was threatened. As the firemen drove up they were loudly hooted by a section of the crowd and there were cries of "Stop them!" "Don't let them put it out." The firemen were not, however, interfered with. They tackled the task of extinguishing the outbreak bravely. The call to the fire was received from street fire alarm box at 8.40, and the effectiveness of the firemen's methods was shown by the fact that the steamer was back at the station again at 9.10, one or two men being left, at the scene of the fire which was then practically extinguished. Two hoses were used, and a splendid pressure of water came from the Umberumberka mains. This helped the firemen considerably. The club was, however, a ruin. The building was gutted, and a great part of the framework was destroyed. The roof of Messrs. G. and R. Wills' warehouse, was slightly damaged. Mr. Marks' cottage, a four-roomed wood and iron place, suffered worse damage, a portion of the gable end being much burnt. The contents of the place were badly damaged by removal. Mr. Desmond had no insurance on his property. The crowd, which had listened to the counsel of wiser heads who pointed out that the club premises were in any case doomed, and that there was no need to allow adjoining property to be consumed, had ceased its hooting and spent the time looking on at the fight which the firemen were putting up against the flames. Sometimes a new part of the building caught, or a portion fell away, they cheered lustily, and sometimes they sang choruses, "Rule Britannia,'' "Australia," and others. In one part of the short street, there was trouble with an inebriated man who was heard to remark that the Australian boys (meaning the members of the citizen forces who were present) were no good. His remark was resented, and he was roughly hustled about, despite his declaration that he was an Australian born, but was eventually rescued by the police. The officers of the law, with Inspector Miller at their head, handled the crowd well, and were greatly assisted by the military, a number of whom with bayonets fixed, helped to keep the crowd far enough away from the burning building to prevent the firemen being hampered in their movements. As the fire died down under pressure of the stream of water that was being poured on to it and the crowd could see the wreck of the building, they seemed to be content with the damage executed, and moved off towards Argent-street with cries of "Now for the camel camp,"
A LONG TRAMP FOR NOTHING. They walked along Argent-street towards Iodide-street. No one seemed very enthusiastic, and the pace was slow. At the intersection or Argent and Iodide-streets, the police, half a dozen in number, spread across the road. Five hundred or so people came to a dead halt. "Go home, like good fellows; you've done enough for to-night," said Sergeant Dimond. The other officers adopted a similarly persuasive course of action. But it was all without avail. The crowd did not seem to want to go home; neither did it seem keen on pushing forward. Numerous of its component units, however, were willing to argue, and they did argue, with the police and with anyone else who would listen. It was pointed out to them that they might get a warm reception at the camel camp. None of them were armed, while it was suggested that the Afghans would certainly be formidably armed and equal to protecting themselves. In the midst of all the argument a hoarse voice chimed in, "Remember our women who were shot," This was repeated several times with alterations and additions. "More will be shot if the Afghans live," "The Germans will bribe some more of them to do their dirty work," "We're not safe while they're alive," were some of the remarks made. Remonstrance was useless. Efforts were made to convince the people that the Afghans were not Turks, and that it was Turks who were the perpetrators of the train outrage. It did not matter; Turk, Hindu, or Afghan - they were all much of a colour, and, therefore, branded. And so the crowd flanked round into Iodide-street, 'but were again pulled up by the police. The arguments this time were not prolonged. After about a couple of minutes wait an armed detachment of the citizen forces (82nd Infantry) with engineers and civilian volunteers, came marching briskly along Iodide-street. They passed straight ahead, and were followed by a straggling crowd right up to the North Camel Camp. Here the military, under Lieut. Anderson, and the police headed by Inspector Miller, again joined forces. A cordon of armed men was stretched across the roadway and approximate to the camp fence, and no civilians were allowed to pass. At one time, there was a bit or rough play amongst the crowd, but no damage was done. Gradually the crowd melted away, some, as they came, on foot and some in taxi-cabs, a number of which were in waiting, and did good business carrying loads of people between the camp and the city. Some of the troops remained on guard for the greater part of the night. AT THE NORTH CAMEL CAMP. A DEMONSTRATION AND A CHECK. POLICE AND MILITARY FIRST ON THE SPOT. The Asiatics' settlement at North Broken Hill is situated at the extreme northern end of Williams-street. The "camp" as it is called, consists of a few galvanised-iron buildings straggling irregularly around an area of two or three acres. The land here consists of blocks or allotments each one acre in area, like all the other residential land outside the central portion of the city. Two or three of these areas are held by Asiatics. Here they live during the intervals of their periodical trips with their camels across country to the various stations and settlements to and from which they carry merchandise. It is here that their business depot is situated, and here their camels are to be found on their return from a trip except when they are sent adrift to graze on such feed, as may be obtainable on the surrounding land. The buildings are of a rude and flimsy character, the most substantial being the one that is used as a mosque. This place of worship is attended to by priests of the Mohammedan religion. At half-past nine, all was perfectly still at and about the camp. There was not only no sign of disorder, but there was no sign even of life. Then a couple of motor cars drove up and stopped in the silent street. As the passengers jumped out of the cars, it was apparent at once that they had an object in view, and an urgent one. and unmoved. A man who accompanied the police party averred in strong terms that the Asiatics had a constable imprisoned within the building. Inquiry of the priests elected a calm denial. This denial was rejected, by the informant, and to set the question at rest it was decided to make a search. Entry was not opposed. Some went round to the back door. Two or three remained at the front door. These latter soon got tired of waiting, and one turned the handle of the door, which was not locked, and entered the building. The room they stepped into was about 20ft. long by about 15ft. wide. In the dimmest of light it could, be seen that on one side there was an alcove in the wall apparently for the reception of a sacred image or ceremonial vessels, or possibly as a praying stand. The floor was heavily carpeted, but apart from the carpet and one or two lamps, the room held no furniture. Those who entered had undoubtedly profaned the sacred building as they were not only unbelievers, but had marched in with their boots upon their feet. On seeing that all was harmless within, the party returned, and then it was explained that the visit in force was not in consequence of the alleged seizure of a constable, but for a quite contrary; reason, viz, that the authorities feared a repetition of the proceedings that had taken place a little earlier in the evening, at the German Club, and had hurried a force to the scene to preserve order. The force was there none too soon. By the time the party which had visited the mosque had returned to the road where the cars were, after leaving a guard, near the buildings occupied by the Asiatics, a crowd apparently numbering some hundreds was seen surging down the road. But before they arrived opposite the camp, where the motor cars stood, the lights of which had drawn the crowd to that spot, a detachment of military had arrived. Lieutenant Anderson was in command, and Lieutenant Resch, area officer, had arrived on the scene with the police, and the advance guard in the cars. Lieut. Anderson rapidly formed his company in line, extended them a few paces apart, thus making the line equally as long as the extended front of the crowd and then marched them slowly across the road gently pressing back the massed line of angry civilians whose advent was the cause of anxiety to the authorities. There was every reason for anxiety. If the Afghans and half-Afghans who comprise the population of the camel camp had been attacked, and, their buildings wrecked as had been done in the case of the German Club building, there would most certainly have been a terrible retribution enforced by the Asiatics, upon their unarmed antagonists. While the main body of the agitated crowd was held in check by the line of military, pickets were posted at all the other approaches to the Asiatics' buildings. These were alert, and instantly challenged and turned back all who approached the area of the camp. A cart containing two police and some civilians which came from the direction of Stephens Creek was inexorably held up by a couple of pickets, and compelled to make a detour clear of the disturbed area. One picket who was posted alone at the entrance to a lane leading off the street where the crowd was and which passes along, at the back of the Asiatics' camp, had his hands-full in stemming a strong disposition to push past him and had he been less determined there certainly would have been a breakaway at this point. But Lieutenant Anderson noticed the pressure and soon had the picket reinforced by several of his men, who were accompanied by constables, and this danger passed. Gradually the inaction of waiting in idleness, had its effect, and about half an hour after, the crowd arrived it began to drift away. Soon the drift became general, and then the military and police were left in sole possession of the ground. As the crowd considerably diminished, reassembled in Argent-street some time was spent in talking over the situation. The ringleaders then proposed a "visit to Crystal-street, with a view to making an attack on some houses there, occupied, or alleged to be occupied, by Austrians. The plan, however, got no further advanced than talking, and at a little after midnight, very few of the crowd remained in the streets.